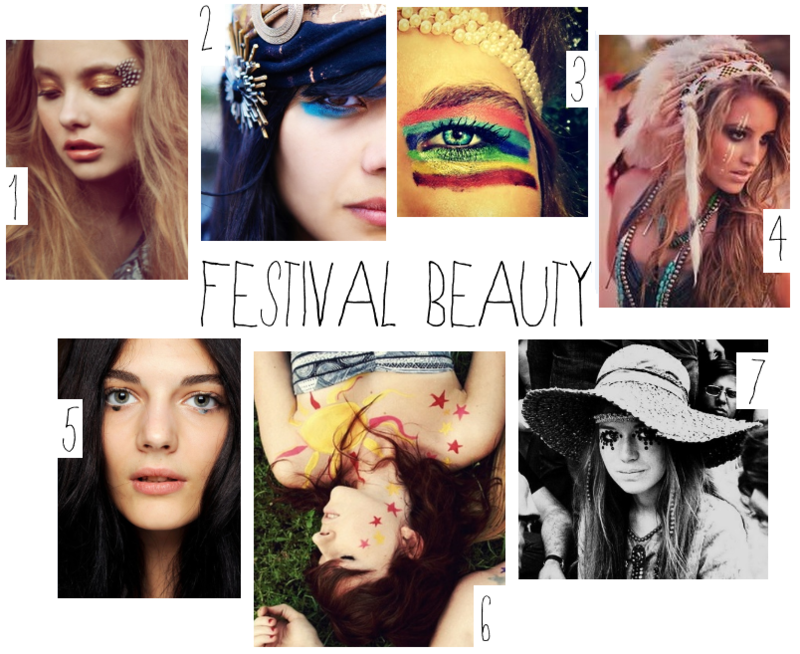 My very nice festival style guide to what pretty things you should put on your head and your feet and your face at a festival, just in time for Glastonbury. You’re welcome. The joy of being in a field full of hippies is that you can do literally ANYTHING you like to your face and get away with it. In fact, it might make you new friends. If you tend to like to fantasise about wearing gold sequins on your eyebrows to the pub or rainbow facepaints to work, now is your time to shine! Raid Claire’s Accessories’ discounted makeup section and do what your imagination and your collection of Barry M glitter crayons dictate. In practice, the easiest way to get through a whole day of copious cider-drinking, sweaty suncream-wearing and rioteous Rolling Stones-adoring is to choose one strong colour or feature and keep the rest of your face simple. If you’re pretending to be a grown-up, subtle gold eye paint and stick-on feathers (1) is an elegant way of making your eyes the focus. Use bright waterproof crayons to highlight under your eyes, war paint style, like Natasha Khan of Bat For Lashes (2), or go for softer cream vertical lines if you’re rocking the Indian princess vibe (4). Can’t pick a colour? Make blue eyes pop by rocking every shade at once (3) – double rainbow on your face! If you’re still fantasising about sequins, try sticking a few silver ones under your lashes (5) or take inspiration from the original Woodstock ladies with bright 70s sunburst patterns (7) around your peepers. If you fancy full facepaints, avoid generic sugary butterflies and swirly lines – stick to bold geometric stars and suns instead, (6) they’re light years (light years! see what I did there?) cooler. Your hair will feel like a small bird died in it by day two. This is the rule. If you aren’t a fan of attempting to sluice it with fairy liquid in a sink every morning, then there are clever ways of disguising less-than-fresh festie hair. Well, there are essentially two options – plait, braid or wave your hair, or camouflage its misery with hats, headdresses and other pretty things. Plaits are your friends. This gorgeous braid wheel hairstyle (10) doesn’t just look attractively like a boho Danish pastry, it also keeps your hair off your face and out of the way. Follow the handy step-by-step guide from Cosmopolitan to attempt it yourself. Plus, when you undo your plaits the next day, you’ll have beautiful waves – spritz them with dry shampoo and you’ve bought yourself another whole day of Acceptable Looking Hair. Another way to revive lank locks is to confuse people with bright colours (12). Spray them liberally with Got2B Mermaid Look Salt Spray (surf hair in a bottle! ), then rub a Colour Bug through the ends and you’ve got a beautiful beachy dip-dyed effect that washes right out. Not that you’ll be washing. And the other option is camoflage. Flower wreaths are a bit 1990s bridesmaid, non? Try using loose fabric daisies instead to decorate a relaxed plait, or stick my favourite – a feathered headdress – on your noggin. I’m a huge fan of a headdress. Go all badass Pocahontas, minus animal sidekicks, with a gorgeous feathered creation from Racoon Circus (11), where vintage queen Laila makes a host of delicately beautiful crowns and clips, or invest in a statement (read: huge) Indian Chief number from Hapuska (3). Or just do what we did last Glastonbury (4), and buy a kid’s one from Ebay to customise with sequins, pompoms and ribbons. 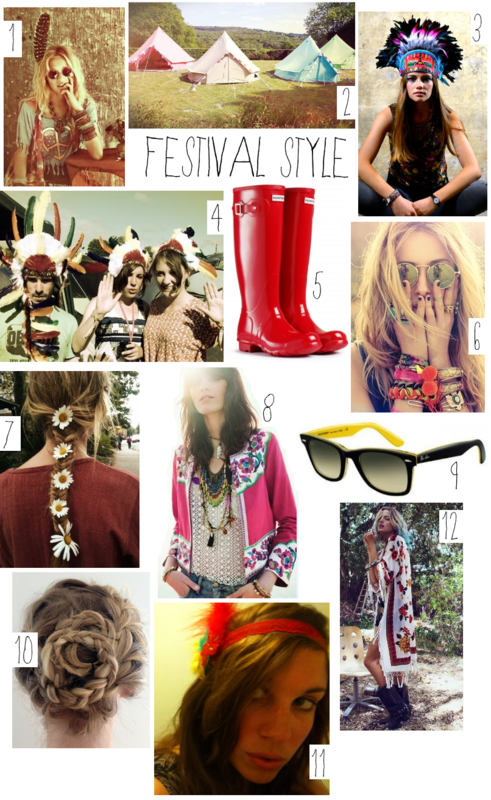 The other absolute must for your festie face is a classic pair of sunnies, preferably Rayban Wayfarers. I love the gorgeous sunshine yellow on the inside of these babies (9) from SunglassesUK.com. Alternatively try 70s round frames if you’ve got a smaller face (6). Keep things simple wardrobe-wise by scouting out intricately patterned but comfy separates like an embroidered jacket (8) or a kimono (12), and you aren’t festival-ready, in my humble opinion, with out a pair of glossy hunter wellies – visit www.skatehut.co.uk to pick up these pillar-box-red beauties (5). And finally, where are you going to keep all your fineries? If you want to make your Instagram followers writhe with envy (of course you do), just casually pose in front of one of Boutique Camping’s ridiculously beautiful bell tents (2). Their pastel hues and bunting are almost too beautiful to let near mud and grass. And finally kids, whether you channel Kate-Moss-Does-Glasto grunge or Coachella hippie chic, resist the temptation to spend hours intricately applying false lashes or wearing anything lovely but impractical (like, say high heels). Festival style is great to play with, but don’t forget you’re there: to dance like a loon, eat dodgy looking street food and fall over low walls with your mates. P.S need advice on the practical stuff as well as festival style tips? Check out my essential festival packing list.